If you liked the movie Minority Report and that cool gadget that could look into the future, here is something that looks just as cool. Remember – only looks just as cool! Presenting the Sensisphere. This device that’s the interactive user interface to a whole new level. You can use your hands to browse through and work with multimedia-based content. Integrated into the surrounding architecture, the interface will offer a similar convenience as common to touch screen systems but, without needing to touch it! 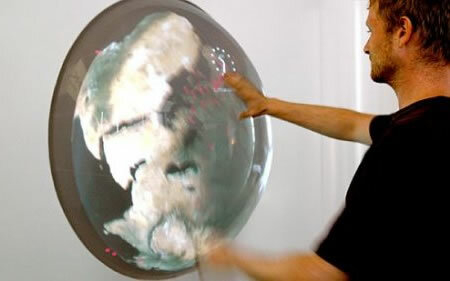 Users can navigate with three dimensional hand gestures and only the selection of the shown content is done by touching the screen. The Sensisphere can be seen replacing familiar interfaces such as the mouse and keyboards whenever suitable. Developed by Martin Spengler and Benjamin Mayer, both of whom are diploma students at the University of Applied Science in Augsburg (Design Department), the Sensisphere makes technology look more and more like magic!